Baked Mangrove Jack – o frabjous day! Baked fish is such an easy weekday dinner – very quick and simple. We grabbed two reasonably sized fillets of mangrove jack from the supermarket and baked them with shallots, chives and pepper. Finely slice the shallots, red onion and chives. Place the fillets of fish on some tinfoil, and sprinkle the chopped herbs over them. Season the fillets with salt and pepper, and then if you wish place some lumps of butter on top of them. Place a second sheet of foil over the fish, and carefully fold in the edges, so that the fish is in a sealed packet. Place the foil packet on a baking tray, and put in a 180C oven for about 10-15 minutes, depending on how thick the fish is. Fish cooks surprisingly quickly, so don’t overdo it. 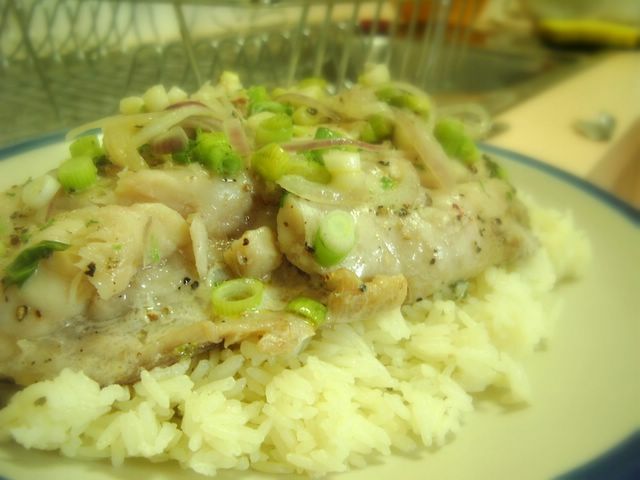 Serve the fish on a bed of rice, with a drizzle of the butter over the top. I’d like to try this with a dill and lemon topping as well.